sitecollections, and offcourse security trimmed. 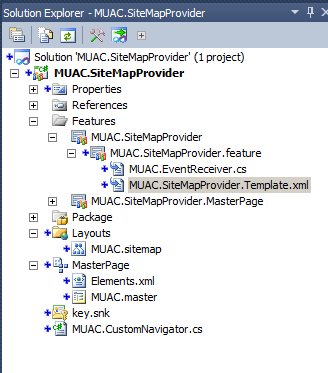 To create a custom sitemapprovider a created a sitemap file. The next step is to tell SharePoint that this provider exists, therefore we need to change the web.config file. We could do this manually but if you have a large farm mmmm…. In the code I created a method to add or delete a setting from the web.config. Dont mind the type property yet, we will get back on this later. The last thing to do is to modify your masterpage. You need to search in the masterpage for the ‘SharePoint:AspMenu’. You need to change the DataSourceId to the one you just added to your masterpage. Also change the ‘MaximumDynamicDisplayLevels’ else you will not have submenu’s. I you now save , publish… this master page in to your SharePoint and deploy this feature you will have your menu. This should be done automaticilly! So we add a new feature site scoped, this feature will only deploy the masterpage. To do so we need to add a new module to our solution I called it ‘MasterPage’. 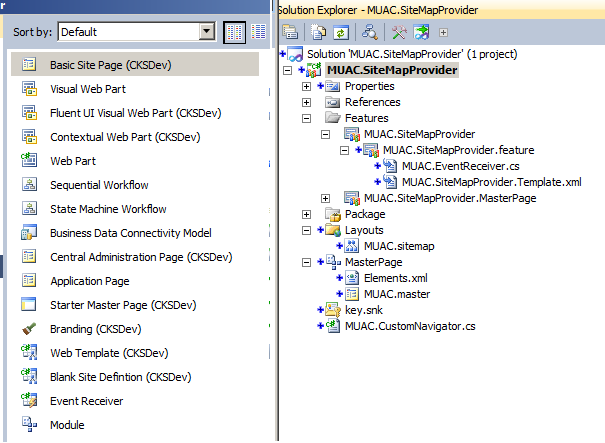 Remove the sample file and add your masterpage (MUAC.master) to your module. This module is just deploying the masterpage. To do so we add a new feature because this cannot be combined with our first feature because that one is not site scoped but webapplication scoped. Next we want that the masterpage is automaticilly set so we do not have to change every sitecollection manually. SPWeb topLevelSite = site.RootWeb; // Calculate relative path to site from Web Application root. Add ‘InstallMasterPage ‘ in the feature activated and the ‘UnInstallMasterPage’ in the deactivation method. So this will activate the feature that contains the masterpage if it is their, also activate the publishing features on every site and subsite. And next it will set the masterpage, when you deactivate it will reverse the settings again. It just loops through all sitecollections and changes the propery of the masterpage. This piece will acctivate our other feature that holds the masterpage, your guid will properbly be different. You can find it in the properties of the feature, the one that contains the masterpage. The code is not hard to understand so I’m not going to explain eveything. But let’s look add the code of our first feature again where we added a provider into the web.config. This provider needs to referr to this class and asssembly because we created our own Navigator. The type property needs to referr to our class !!! When you now debug it should your class and checking if the user has access or not. As developper you know you have to change certain settings in the web.config to get the actuall error in your SharePoint. Through code we can manipulate the web.config so why don’t change those settings in a feature ??? If you have a webpart or a custom form where you use the SharePoint peoplepicker you have to fetch the values of the control to place them into SharePoint. And now the values will be saved into your list. This checks for groups and users.